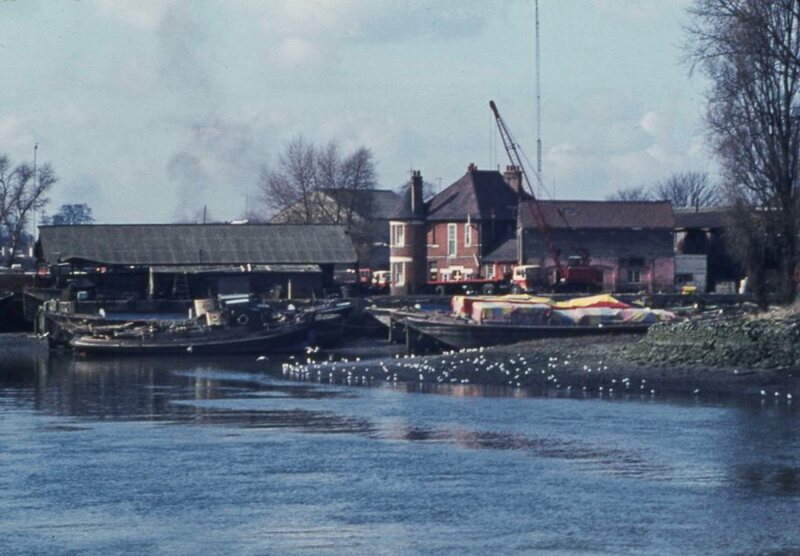 Peter Young took this photo of a tranquil-looking Goat Wharf on 2nd March 1974 - perhaps low tide from the gulls on the banks? The distinctive red-brick building is the Ferry Hotel, licensed as The Bunch of Grapes, the home of the ferryman who took people across the Thames to the Surrey side of the river. Around 1905 Arthur East took people over to the waterside entrance to Kew Gardens and offered 'boats of every description for hire by the hour , day or season' (advertisement - Brentford and Chiswick Pubs). There are documented references to the ferry back to 1536, before which residents of Old Brentford could use the ferry for free (Brentford Past; this includes the ferry's history; Books etc. has publication details of local history titles). The site includes a postcard from the early 1900s which shows a similar view but from a little further west. The Tickner family lived here until a couple of years after WW1 and must have followed the East family, who were resident until around 1909. The alcohol licence was surrendered in 1922 and by the time the photo below was taken the building was used as offices. There is no sign of the Brentford Dock Estate development as yet below and the hotel building was to survive another nine years; it was demolished in 1983.